The picture is broken for me. Aleksandr Filimonov (Russia): Was Spartak Moscow's #1 goalie as the capital-based club won several league titles in a row. His career waned surprisingly early for a GK, but I believe his peak was higher than any of the alternatives. John Arne Riise (Norway): Needs no real introduction here, Riise was an excellent left-back who won quite a few trophies throughout his career. He spent one season in Cyprus when in his mid-30s, before moving on to India (maybe I'll do a few non-European leagues in the future?). Iván Campo (Spain): Yes, he did end up playing for Bolton under Allardyce while sitll in his 20s and yes, he was only capped 4 times. However, if you have started in a Champions League final and won the title for a club like Real Madrid, then you are a quality player. Traianos Dellas (Greece): Was only a matter of time before a Greek player would appear here, right? Well, after the outstanding performance he had at the Euro 2004, he surely deserves a spot in the team. Even aside from the NT, I'd say that his time in Roma was pretty decent. Christos Patsatzoglu (Greece): I originally wanted to select Marco Motta here, but I can't find any evidence of him making any appearances for Omonia this season. Oh well, Patsatzoglu is the next-best option, as his long service for Olympiacos would indicate. Aldo Duscher (Argentina): Every team could use a tough, tackling central midfielder, and Duscher certainly fits that description. He spent most of his career in various La Liga teams, most notably Deportivo. He had less luck in the national team, though, due to the fierce competition. Terry McDermott (England): Part of the highly successful Liverpool team that won numerous trophies in the 70s & 80s. His England career was less stellar (25 caps), but overall a terrific footballing resumé. Hennadiy Lytovchenko (Soviet/Ukraine): Another one from back in the day. The midfielder had his prime in the domestic league in the 1980s; for example, winning the ”Soviet footballer of the year” award in 1984. He also played in the Greek league for a few years. For his national team, he was capped over 50 times and participated in three consecutive tournaments. He gets the RM position here. Sávio (Brazil): On the left side, we have Sávio, the Brazilian winger who had a lot of success in Real Madrid, including 3 CL titles. Rarely got the chance to play for Brazil, but that can be said for a lot of fantastic players throughout the years. Ray Kennedy (England): Used to be a forward, before switching to left midfielder in his Liverpool days. With all his accolades, it is impossible to leave him out. Underused in the national team, though. Oleg Blokhin (Soviet): Who would've thought that the small nation of Cyprus would be able to come up with such a strong team? Blokhin, of course, is the cherry on top, having been one of the best strikers in the world during his prime. The prolific goalscorer won Ballon d'or back in 1975. I recently discovered that Brad Friedel & Bobby Moore have both played for Danish clubs. Both would undoubtedly replace Roy Carroll & Mellberg/Boulahrouz in the lineup for Denmark. Brian Greenhoff for Finland. Is this top tier only? Otherwise, add Leonid Buryak and Nikolai Larionov. Not sure how good exactly Jozsef Varga was, but probably enough to earn a spot here. An unnusual kind of best XI. 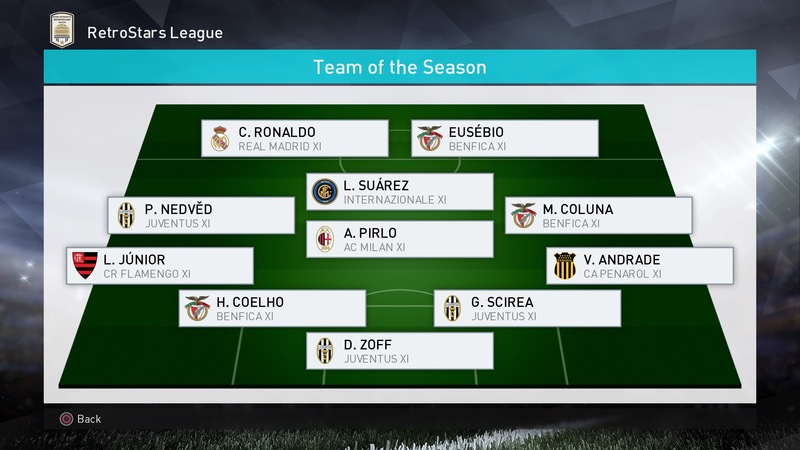 Intercontinental RetroStars League - Team of the season. I'm guessing Benfica won the CL and/or Portugal won an International trophy this 'season'! Probably with Juventus and/or Italy going close (or the other way round even). Thanks for your input, Ariaga. I appreciate it. This is for any tiers, just have to have played a minimum of one game in said country. These are all interesting names and good enough for the starting lineup. I had considered Buryak, but wasn't sure whether he actually made any appearances for KP-85 or just managed them. Want to make a series of longevity-related teams. Let's start out with the oldest team consisting of current Premier League players. Next up is a team consisting of active footballers worldwide (at pro level preferrably) born in 197X. As one can imagine, there aren't that many of them left at this point, especially in each position to make a balanced 11. Interestingly, all 11 of them are in a club that belongs to the highest division in respective league. All the outfield bench players, except Hilton & Lee, play in a 2nd or lower division league. Time for an era-specific team. By that, I mean a team consisting of active players who were part of an international tournament at senior level 18+ years ago. So that means before 2002. Some names may overlap with the previous teams, as one can imagine. All of them, except Myojin, play in the highest division of their club's league system. Also, he wasn't really a right-back, but I was unable to find anyone else for this position so he'll have to fill in here. Inamoto, Abreu & Miura are the only ones playing in a lower division. BEING described as a difficult opponent by someone of Danny McGrain’s class must be a huge honour. Not many players got the better of the Celtic legend during his distinguished career for club and country. The Celtic legend made 663 appearances for the club, putting him fourth in the all-time list. He was an inspirational captain in the Hoops and a hero to a generation of supporters for his commitment, talent and leadership. The 64-year-old also made 62 appearances for Scotland, skippering the national side on 10 occasions, and starred in two World Cups. To impress someone of the full-back’s calibre, you had to be incredibly gifted and that’s reflected in the Best XI he faced as told to the Celtic View recently. Obviously, he made a lot of great saves in his career and was very authoritative in his area. I played against him in all the home international games. He was the first goalkeeper I saw really talking to the back four and giving instructions, which gives the defence confidence. He was a professional and a great enthusiast. We all love the game but he took it to great heights, getting over 100 caps for England says it all. He was strong and had everything a goalkeeper should have. He was the left-back for Brazil when Scotland played against them in the 1974 World Cup, a game we drew 0-0. We were perhaps in awe of them as they had won the World Cup four years earlier, and this guy stood out as a he was a good defender with good ability – and also because of his big curly hair! At the end of the game, I changed jerseys with him. I always wanted to meet Bobby Moore and it was great to have played against him in the Scotland-England games. To have met big Billy McNeill, the captain of the Lisbon Lions, in the first place was fantastic and then I met Bobby Moore, the captain of England’s World Cup squad. He was a wonderful player. He was a bit like John Clark, who played here for a long time, in that he was a great reader of the game. Bobby Moore was big, strong and had this terrific ability to anticipate passes and get in the right positions. He was an excellent tackler and also had the skills and confidence to come out of defence and pass the ball. He and Pele also had a great respect for one another. Another England player I came up against. He was someone who never looked under pressure. Again, he was a Bobby Moore type of defender in that he was good with the ball at his feet. Colin Todd wasn’t a typical centre-half, who simply won the ball. He was strong in the air and comfortable on the ground. He was able to bring the ball down and build things from the back and link up with the midfield, rather than some centre-backs who were happy just to get the ball out of the danger area. I admired everything about him as a player. He had a great physique and was so quick. At the peak of his career, you never knew what he was going to do next. But he was also brave and worked hard. He played in good teams and exuded confidence but he deserved it and worked for it. While this gave his team-mates belief, the opposition would be fearful of him as he could change a game instantly with a great pass, run or shot. He was a magnificent player. He wasn’t young when I played against him in the 1982 European Cup tie against Ajax, in fact he was his last years as a footballer. Graham Sinclair picked him up in the second game, which we won 2-1 to go though, and ‘Sinky’ would put that down has one of his greatest games. I played against Colin Bell in the Scotland-England games. He was a midfielder that had the ability to see all the channels that were open to him. He was an astute player and could choreograph things from the middle of the park. He was also good in the tackle, a rare quality in many players today. He was a grafter, a playmaker and you can see by all the goals he scored for Man City that he was able to get forward and contribute in that aspect as well. He had a brilliant left-foot. In the first leg against Ajax at Celtic Park, every pass he made was a good one and caused me problems. He was putting balls inside me, over me or to Jesper Olsen’s feet. When we went over there for the second leg, we got someone to stand close to him and we managed to nullify his threat and stop him supplying players like Olsen. He went to Bayern Munich after Ajax and had a very good career. A player with a magical left foot, who had won the World Cup in 1970 with Brazil. Rivelino could strike the ball very well and took a lot of their set-pieces. He was great to watch on TV but it wasn’t so good playing against him as we did four years later. His team-mates knew what he would be doing and run off the ball before he made a pass. However, it was a great experience to have played against him and Brazil in a World Cup match, particularly as they were the holders of the trophy. Some of the players who had played in’70 had lost a bit of pace or desire, though, and found it hard to repeat what they had done before. Jesper was just so quick. When we played Ajax no one said to me, watch for this winger as he’s got a bit of pace. In first five minutes of the game at Celtic Park, he got away from me twice and had scored the opening goal. I was thinking, ‘where did he come from? !’ Lerby just kept putting the ball inside me and I was usually quite happy about getting back to these types of passes with the pace I had, but this wee guy was just so fast. I had never played against anyone like him previously. He had a great left-foot and my job was to stop any crosses going into the box but sometimes you just can’t do it if someone is as quick as that. He got his move to Man United as he gave me such a roasting! Although I came through the ranks at Celtic alongside Kenny and then played with him for a number of years, I had the chance to play against him in Jock Stein’s Testimonial in 1978 when Liverpool came up to Celtic Park. He was just a brilliant player and he had so many great strengths. Physically, he was very strong and rarely got injured. His game awareness was incredible in the way he could spot players making runs or making space for him, and, of course, he could also score goals. To play alongside him as a striker must have been a dream as he put so many goals on a plate for them. A wonderful player... he wasn’t the best in the air mind you! I played against Ian Rush in a charity match at Celtic Park in aid of Kenny’s charity. It was about eight years ago. I was 56 and I was facing Rush and Kenny which was scary! Big Lex Baillie, who is now a sergeant in the police, was beside me in defence and Rush’s movement just frightened us. There is nothing a defender likes more than having a striker to pick up but as a soon as he stars moving about, you aren’t sure whether to go with him or stay in position. By the time, you have made your decision, the ball is in the back of the net. Rush always had the ability to find space in the box and he was very quick. Going through one-on-one on a goalkeeper, he was always confident and composed and made it look easy. If you play at Liverpool, you must have that kind of belief, and when Dalglish is beside you, then you know you will get a lot of chances. They were a brilliant pairing. TOMMY Callaghan played for Celtic for eight years, between 1968-76, making 284 appearances for the Hoops and scoring 33 goals. He joined the club from Dunfermline Athletic, having already enjoyed six successful seasons at East End Park and, indeed, he has the distinction of being the only player that the legendary Jock Stein signed twice – first for Dunfermline and then for Celtic. During the late 1960s and early ‘70s, Celtic were one of Europe’s top teams, competing in the European Cup against the continent’s best sides and players. And so Tommy Callaghan had a tough choice when it came to selecting the Best XI he faced during his career. Pat Jennings was a great goalkeeper, a brilliant presence behind the defence and so commanding. We played Spurs in a pre-season friendly in August 1972 and beat them 1-0, and I managed to score the goal. It was a shot from about 25 yards out that beat Jennings, so I was pleased about that. He also scored a goal himself once, in the Charity Shield, but as a goalkeeper, he was top-class. He could play anywhere, and I remember going down to Leeds United to play against them in friendlies, and Jock telling me to keep an eye on him. He thought Paul Madeley was a great player, and he played so many different positions. He played all of them really well and he was a great player to have in your team – he was really dependable. He was an accomplished centre-half. He could go forward, he could defend, and he was a defensive general. He could also score, and scored some great goals. Ajax at that time were an excellent team, and their central defenders were good football players. All of their players could play football, no matter what position they were asked to play and that came from the way they were coached from a very young age. Ruud Krol was a top player in a top side. The Italians were very defensive in their style of play at that time, and all their teams had strong defenders. We played Fiorentina in 1969, and we did well at home, beating them 3-0, although they won 1-0 in Italy. Ferrante was tough, solid and did his job, and like the other defenders, if he wanted to kick you, then he’d kick you. But they were a top country, and we did well to beat Fiorentina that season. He was the top man for Inter – the film star of the team. He had it all. I played against him and obviously I remember him from the 1967 European Cup final as well. He was a big figure in their team and he was a good left-back for them. He was a good player going forward, and won a lot of caps for Italy as well. He stood out – he was big, good-looking and a top player. You could just give him a ball and let him play. Two of the great football tragedies were him and George Connelly retiring early from the game. I played against him in America and he was an absolute God over there. He always ran out last and the crowd went mad for him. He was a lovely guy, very quiet. When we played against him, he’d been out the night before so we thought that would be good, but he came out and was absolutely brilliant. He had everything. He never stopped from first minute until last. He was a great young player, and also made his name in the international team as well. I wouldn’t say he was the silkiest player in the world, but he was a really good midfielder, very strong, good in the tackle and he was an important part of that Ajax team. I always enjoyed playing against the bigger teams and the best players, and Neeskens was right up there among the best. It would have been good to have reached the final in 1972 and played Ajax. That would have been a great game. To come through what he did was unbelievable. You always think of Bobby Charlton galloping through the middle of the park with the hair going everywhere. He was a great youngster, but he came back after the Munich Air Disaster to become a superstar for Manchester United and England. He was, and is, a tremendous ambassador for football. He was also one of England’s key players in 1966. They also had a tremendous leader in Bobby Moore – he was my favourite, but I never played against him, but Bobby Charlton was a top midfielder, and he could hit a shot from anywhere with either foot. At that time Benfica were one of the best teams in Europe and Mario Coluna always stuck out for me in what was a great side. He was the skipper, the No.6, and he was a good captain. He organised the team and held them together. They were so lucky to have Eusebio, who was half-a-team in himself, and they had the big centre-forward, Torres, but Coluna led the team well. He always played well for Benfica and stood out for me. He’d be my captain in this team. He was the best player I ever faced during my career. He’s right up there with the very best – with Pele, Di Stefano, Maradona, Messi, anyone you can name. Cruyff meant so much to the Ajax team at that time, and to the Dutch national team as well. I still enjoy watching the clip of that brilliant turn he did in the 1974 World Cup. And he was a brave boy as well. When we played them at Hampden, Jim Brogan gave him ‘what for’, but he never moaned or groaned, just got up and got on with the game. And at that time, for me, he was the best player in the world. He made really good teams into great teams. He had such a good football brain. Eusebio was incredible. He was so quick and he could make something happen in the blink of an eye. That tie against us in 1968 when we won 3-0 at home and they beat us 3-0 in Lisbon, was just tremendous football. He had pace, great control and could finish, and when you think of some of the pitches he played on as well. Now, the playing surface is perfect. But Eusebio was one of the best strikers I came up against. When I played for Dunfermline, Bobby Murdoch was always the most difficult opponent. He was such a good player. He could spray the ball about, and he was up and down the park, but there were a lot of great players in that team. Stevie Chalmers was another player you didn’t like coming up against. Running at you, he had so much pace. Stevie Murray, when he played for Aberdeen, always gave me a hard game. He was a great midfielder, and eventually came to Celtic. He was wiry and he dug in, so you always knew you were in a game. And, of course, it was always a hard game whenever we played Rangers. A FASCINATING new series in this season’s Celtic View sees former Celts pick their Best XI from players they’ve faced during their time in the Hoops. Here’s a taster of what is already proving to be a very popular series, as Lisbon Lion Jim Craig picks a very impressive team of top stars. There have been many changes in Scottish football since the days of the late 1960s and early 1970s. One of these is the nationalities of players who make up the various teams. In most Scottish sides today, it is quite the norm for several of the players to come from ‘foreign’ parts, not only the continent of Europe but even further a-field. That was not the case all those years ago. Most of the players were Scots, with the occasional Englishman, Irishman, Welshman or European. Many of these were excellent performers and difficult opponents but to make this article more cosmopolitan in its outlook, I have only included stars who played for sides outwith Britain and Ireland, so names like Bobby Moore, George Best and Bobby Charlton are missing. There is one other obvious missing name. As he only played for 12 minutes or so in his testimonial match at the Bernabeu in 1967, I have reluctantly had to leave out Alfredo Di Stefano, who would have been a certain starter in my team of the ‘Best Eleven Players I Faced’. Let’s start right at the back, with those who wear the No.1 shirt and immediately I have a confession to make. I am not a great fan of goalkeepers. Now, granted they are an essential cog in any side but they are also a moaning bunch. They moan that they can’t see the ball when a good defender stands in front of an opponent who is about to shoot; however, if you don’t do that, they then complain that they are not being protected and you should have stood in front etc, etc. They also receive praise when they were just lucky. A fierce shot will come flying towards goal, the keeper puts up a hand to protect his face, the ball hits the hand then ricochets up over the crossbar and then makes it look as though he meant it all the time. Poseurs! Anyway, my choice in goal is a guy called Viktor Bannikov who played for Dinamo Kiev in 1967. He was a very competent keeper who dominated both his line and his penalty area but equally importantly, he was not ‘showy’ and seldom opened his mouth during the two matches. For the full-backs, always the most intelligent, sound-thinking and hard-working players in any team – very often the most handsome too – I have gone for the Inter Milan pairing of Tarcisio Burgnich and Giacinto Facchetti. Both had the Italian motto tattooed across their foreheads – THOU SHALT NOT PASS- and complemented each other, Burgnich very much the more defensively-minded of the duo while Facchetti could use those long legs to come forward with great effect. And speaking of ‘THOU SHALT NOT PASS’, I have chosen two more practitioners of the dark arts as my centre-back pairing. Giorgio Malatrasi, an Italian, and Karl-Heinz Schnellinger, a West German, were both in the AC Milan side which beat us 1-0 over 180 minutes in 1969. Malatrasi was an out-and-out ‘stopper’, whereas Schnellinger, although solid in defence, could also play himself out of any trouble. Now to midfield, often spoken about as the crucial area of the side. I am not so sure of that. After all, at the recent World Cup, a guy called Pirlo, who looks on the park as he is approaching his mid-50s, seems to cover only about half-a-mile in 90 minutes and receives great praise for putting out a series of five-yard passes? My midfield certainly would work harder than that. It would consist of Mario Coluna of Benfica on the right, where he would radiate with his usual authority and panache. Johan Neeskens of Ajax in the centre, full of skill but with an edge of steel too and Josef Masopust of Dukla Prague on the left, stamina, control and vision his strengths. In the forward-line, or ‘up-front’, as it is sometimes called, my three choices all had a combination of talents. Eusebio of Benfica was a wonderful player, with a delicate touch, great acceleration and an eye for goal. Johan Cruyff of Ajax had everything, not least the ability to score from any angle and range while Dragan Dzajic of Red Star Belgrade came straight at an opponent, using his dribbling skills and speed. If I am allowed a few substitutes, then I would nominate Sandro Mazzola of Inter Milan, who could cover both up front and midfield plus Francisco Gento of Real Madrid, whose pace would be useful against a tiring opposition. When I played against him in 1967, he was 34 years of age, yet the dazzling acceleration was still there. So, there you are, that’s my eleven. Would I like to manage it? No thanks! From checking the names once more, I fear that there might be too many egos to cope with. You would spend most of the week arguing with them. Would I like to coach the side, then? No again, that might be even more difficult. I reckon that you might need to have three or four balls on the pitch to keep everyone happy! Would it be a successful side? Not necessarily. Having expensive players in every position does not always guarantee success, as a – possibly apocryphal - story about a team from Scotland’s past might demonstrate. The manager headed up the tunnel at half-time absolutely furious with the display of his charges. They had cost a lot of money to bring in but in the first half of the match, they had been abysmal. He decided that they need a short and sharp verbal volley. Gregoriak, comme and wm442433 repped this. Next up is a team consisting of active players at the FIFA World Cup 2002. Since Juan & Guagua weren't selected for that tournament, I wonder if I'll have enough defenders to make a good team? Cole will have to makeshift as an RB, while Beasley drops down to LB. Cole & Wei are the only ones playing in a 2nd division.